If you couldn't tell, I was feeling a little uninspired to blog last week. However, after a relaxing weekend and a little bit of apartment shopping yesterday, I am not only excited to be back on the blog, but also to be sharing the Part II of my Small Space Decor posts! I went to a few stores with my mom yesterday and picked up a few things for my apartment that you might have seen on my Insta Stories. I am so excited about the fun ikat bins I found, a rattan trunk I plan to put at the foot of my bed (maybe with a fur throw on top?) and the most fun "rose all day" tray for our coffee table! I will share more pictures of things I've rounded up possibly in an apartment haul video if you'd all be interested! 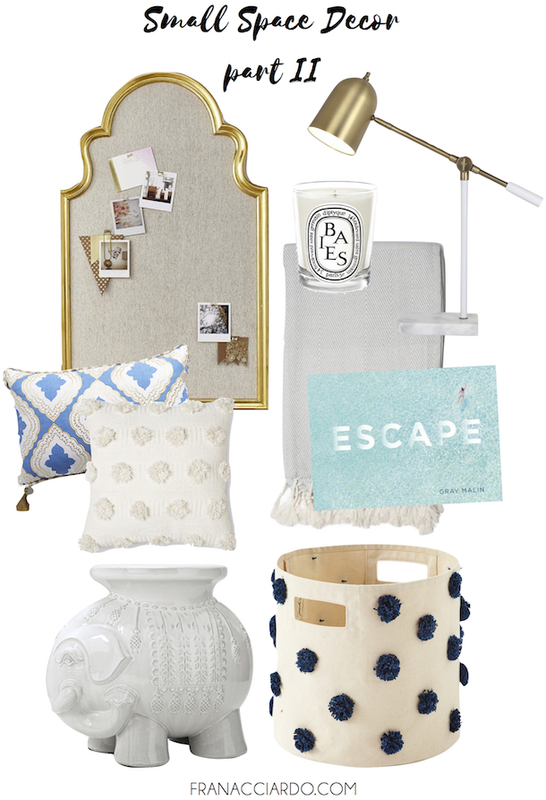 Today, I am just sharing more decor inspo and pieces I am loving. Did anyone else not know that Gray Malin has a second book out, Escape? I hadn't discovered it until writing this post; now I need to check it out! Oh, and that pom-pom hamper? In love. I am such a fan of the gold and blue theme in this round-up. I find neutrals with pops of metallic and shades of blue to give such a simplistic, yet modern and coastal interior vibe. What could be better?! I can't think of anything better than decorating a space that is peaceful and reminds me of the ocean. Happy Monday! To read the first installment of "small space decor," click here. So many cute picks! Love all the pom poms! That gold lamp is SO pretty! I love all these pieces! So cute! Those colors always end up being my go to!